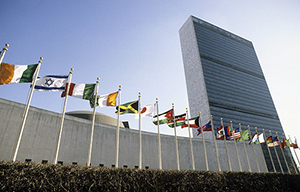 NEW YORK CITY, January 21, 2014 (CNA)—Catholics have joined with members of other faiths to support the Holy See’s permanent observer status at the United Nations, defending against a group of abortion proponents seeking to oust the body from the international organization. “The Holy See’s special status enables it to encourage genuine dialogue, promote peaceful resolution of conflicts, and appeal beyond the mere territorial interests of states to the consciences of their leaders,” said a declaration and petition supporting the Holy See’s unique presence in world diplomacy. The declaration and petition was launched by the Catholic Family and Human Rights Institute January 17. “The Holy See is the conscience of the U.N. It is the only delegation that does not have political considerations in how it negotiates. It negotiates purely from first principles,” he said. Drafted by Princeton Law School professor Robert P. George and William Saunders of Americans United for Life, the declaration noted that the Holy See has been working in diplomacy since the fourth century A.D. It now has diplomatic relations with 177 nations. The group’s president, John O’Brien, used the Holy See representatives’ recent appearance at a hearing of the U.N. Committee on the Rights of the Child to criticize the permanent observer mission. “The Holy See has no right to a seat at the U.N. and should not be signing these treaties and conventions,” he argued January 16. The Holy See’s representatives at the January 16 hearing condemned violence against children and child exploitation, saying that the Vatican in recent years has made child protection a priority. The signatories will be presented to representatives of the Holy See in New York, Geneva, and Rome before the end of 2014. The petition can be viewed in full at www.defendtheholysee.org.